How are the mighty fallen. The once powerful embedded chip maker Conexant Systems - spin off of Rockwell and dominant supplier of modem chips - is to be sold off to up and coming chip maker SMSC of New York. Conexant leaves the industry with a string of legacies through a number of spin offs, from foundry Jazz to telecom chip maker MindSpeed, but the core of chips for imaging, audio, embedded modem, and video surveillance applications will go to to SMSC in a deal valued at approximately $284 million including the assumption of Conexant’s net debt. The transaction has been approved by the boards of directors of both companies. The combination of Conexant’s imaging, audio, embedded modem and video products with SMSC’s broad connectivity solutions targeting the computing, consumer, industrial and automotive markets provides for a highly complementary merger of talent and technology. Conexant has approximately 600 employees worldwide, including over 230 in Asia. “In our industry, size and scope provide a significant advantage with customers and suppliers," said Scott Mercer, Conexant's Chairman and Chief Executive Officer. "SMSC and Conexant share similar core competencies in analog and mixed-signal design, possess complementary product portfolios, and count many customers in common. By joining forces, we get the opportunity to take advantage of economies of scale and drive profitable growth." Sailesh Chittipeddi, currently President & Chief Operating Officer at Conexant, will join SMSC upon close of the acquisition as Executive Vice President, reporting to Christine King. Mr. Chittipeddi’s responsibilities will include all product lines and global marketing and engineering functions for SMSC. Researchers at the National Institute of Standards and Technology (NIST) have issued a guide for managers, network engineers, transition teams and others to help them deploy the next generation Internet Protocol (IPv6) securely. You can also go to http://v6asns.ripe.net/ and choose the list of countries you are interested in for the uptake data updated regularly. To ensure that the US government is prepared for IPv6, the Office of Management and Budget has mandated federal agencies to begin deploying the new protocol. NIST developed the IPv6 security guidelines in support of the Federal Information Security Management Act (FISMA). The publication is designed to help federal agencies avoid possible security risks that could occur during IPv6 deployment. It also could be useful for the private sector and other organizations. Qualcomm’s planned acquisition of Atheros Communications will position the combined companies to take on rival Broadcom in the burgeoning consumer electronics market for wireless connectivity semiconductors, according to market researchers iSuppli. Qualcomm today confirmed it will buy Atheros in a deal estimated to be worth about $3.1 billion. Qualcomm is the world’s largest supplier of semiconductors for wireless products, accounting for an estimated 22.4 percent of global wireless semiconductor market revenue in the fourth quarter of 2010. Atheros ranks 12th in the market with an estimated share of 2.2 percent. “With Atheros adding only 2.2 percentage points to Qualcomm’s portion of the wireless market, this acquisition is clearly not a market share play for Qualcomm. Rather, it’s a pure strategic play, designed to bolster its position in the fast-growing wireless connectivity space now dominated by Broadcom,” said Francis Sideco, principal analyst, wireless communications for iSuppli. Atheros’ main allure is its global leadership in low-power semiconductor solutions that support the 802.11n high-throughput wireless local area network (WLAN) standard, a type of Wi-Fi technology suitable for the transfer of bandwidth-intensive data such as video. After several quarters of effort, Atheros has experienced limited success selling its 802.11n semiconductors in the cell phone market. iSuppli’s Teardown Analysis service has identified Atheros chips in smart phones such as Samsung’s Galaxy 5 and Sony Ericsson’s XPERIA X10. But the company has enjoyed greater success in non-cell-phone products, with design wins in products including Apple’s iMac line, Hewlett-Packard’s Pavilion PC family, Acer’s Aspire PC line, the third-generation Amazon Kindle and Microsoft’s Zune MP3 player. Furthermore, Atheros has achieved strong design wins in home networking routers, positioning it for success in the connected home segment. “While Qualcomm already has its own Wi-Fi technology, this deal bolsters its design capabilities and opens up more opportunities in non-handset devices such as tablets and consumer electronics devices, particularly those in the connected home,” Sideco said. Broadcom currently dominates the market for wireless connectivity semiconductors for consumer electronics, the so-called connected home area. This represents a booming segment of the wireless semiconductor business, with shipments of video-oriented consumer electronics devices equipped with high-bandwidth wireless solutions expected to grow to more than 85.2 million units by 2014, up from 606,000 units in 2009. Ratliff noted that Qualcomm is not alone in its efforts to position itself against Broadcom in this critical area. Other semiconductor suppliers eying the connected home market include Marvell Technology, Ralink Technology and Zoran. Some of the most attractive opportunities for connected home products are televisions and set-top boxes. The acquisition of Atheros’ technology also could help Qualcomm to simultaneously defend against and attack Broadcom in its core business in cell phone semiconductors. Meanwhile, the Atheros acquisition will help Qualcomm address the fast-growing market for tablets. Market research is an important tool in the development of embedded systems, and the firms that provide such data are seeing a key consolidation into just two large and relatively unknown conglomerates. This has happened before, with the Gartner Group taking over Dataquest in 1995, with the resulting loss of key semiconductor research and loss of confidence in the quality of the data and understanding of the embedded industry. This mirrors the recent deals by IHS taking over supply chain researchers iSuppli and screen content data supplier Screen Digest last year. IHS and NPD are relatively unknown in the embedded industry, unlike iSuppli, In-Stat, Screen Digest and DisplayScreen, and while all the organisations are keeping their own identity at the moment, the tendency, as shown by Gartner, is to combine them into a wider group. NPD supplies data to a bewildering selection of industries, including automotive, beauty, commercial technology, consumer technology, entertainment, fashion, food and beverage, foodservice, home, office supplies, software, sports, toys, and wireless. The specialist electronics skills of In-Stat are likely to become lost in this wide range, which would be a great shame. The rise of the high speed USB3.0 technology, particularly the optical version, is leading to a renaissance in the thin client, driving the idea of the 'zero client', says VIA Labs. The Zero Client concept is an evolution of the Thin Client computing model that takes Shared-Resource Computing to the next level with no independent hardware processing facilities. Through multiple zero clients, many users can be simultaneously connected to a single server, leveraging the abundant computing power and flexibility provided by today’s mainstream systems. In contemporary zero client implementations, the end user experience is often bandwidth dependant since each Zero Client requires video, audio, and data connections. 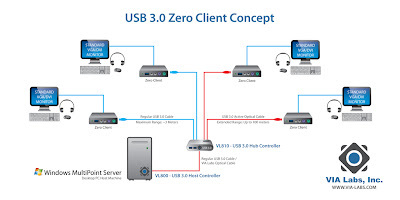 Before the speed and flexibility of USB 3.0, Zero Clients utilized USB 2.0 or Ethernet, and frequently offered inferior multimedia capabilities and a degraded user experience. VIA Labs is demonstrating a zero client based on the new USB 3.0 standard which offers massive bandwidth capacity with its portfolio of USB 3.0 Superspeed controllers where several client terminals can now simultaneously enjoy a full user experience including HD multimedia, using the optical version to get the distance to the terminal previously provided by Ethernet. VIA labs is the only company in the world to have a complete USB 3.0 solution with host, hub and device controller products that are quickly setting industry standards. With an emphasis on delivering leading bandwidth performance while also pursing aggressive power-savings, VIA Labs is paving the way forward for new applications and devices in the broader electronics industry. Complying with USB 3.0, USB Battery Charging, and eXtensible Host Controller Interface specifications (xHCI) the VIA VL800 offers four downstream facing ports that enable the simultaneous operation of multiple peripheral devices and includes USB Battery charging support to rapidly charge smart phones, tablets, and other compatible devices. The industry’s first USB 3.0 hub controller, the VIA VL810 is a highly integrated, single chip solution provides maximum data transfer rates of up to 5Gbps, or ten times the throughput available to USB 2.0 based devices. Enables up to four USB devices to be connected to a single downstream port of a host or hub. The VIA VL750 USB 3.0 to NAND Flash Controller is the first of its kind in the world, featuring a 4-channel memory controller with interleaving support, the VIA VL750 offers consumers blisteringly fast data transfer speeds of 100MB/s or more on larger capacity ‘thumb’ drives and USB sticks. 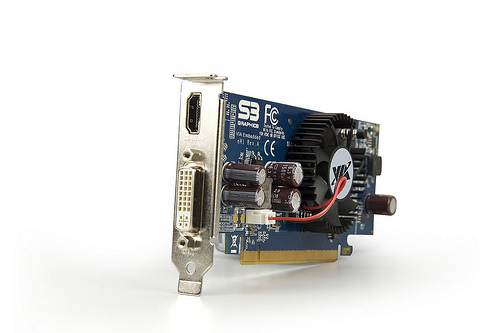 VIA Technologies has developed a graphics card designed specifically for the embedded market. The eH1 is a DX10.1 compliant, multi-display card for the PCI Express slot that comes with the three year product longevity guarantee that is vital for embedded designs and is the most power-efficient discrete graphics and video solution on the market today. The VIA eH1 AIB uses the 64bit S3 Chrome 5400E GPU graphics chip for DirectX 10.1, OpenGL 3.1, OpenGL ES 2.0 and offers multi-stream 1080p HD video decoding and Stereoscopic 3D rendering capability alongside 512Mbytes of DDR3 memory. This makes it the ideal solution for a range of embedded applications that require advanced graphics and video on multiple displays. The VIA eH1 is a low profile PCI Express add-in-board designed for next generation embedded applications in a range of segments including digital signage and advertising, POS, POI, gaming or any embedded application where graphics and HD video is streamed on two displays.